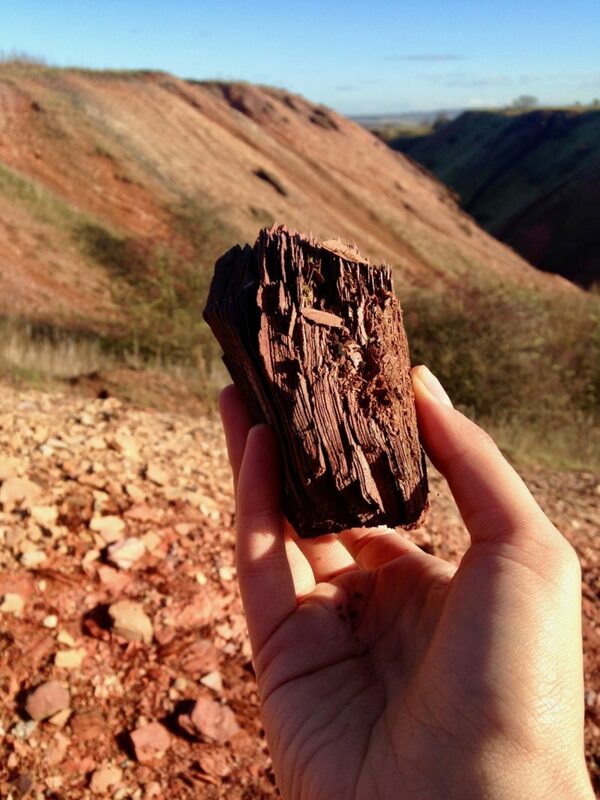 Reddish, fine-grained and crumbly to touch, shale is the most common sedimentary rock. It is composed of thin layers that can be easily split along lines of weakness. In geology, this tendency is known as ‘fissility’ and results from the process of compaction. Fissility is also a term that evokes current (and often well-meaning) appraisals of identity politics. Something along the lines of: our layers are fracturing when we should be united! Where are the compacting forces that used to make us stick together! In the nineteenth century, oil-bearing shale was mined in enormous quantities and refined into millions of gallons of shale oil or paraffin. This powered the lamps, street-lights and candles that illuminated the Industrial Revolution. 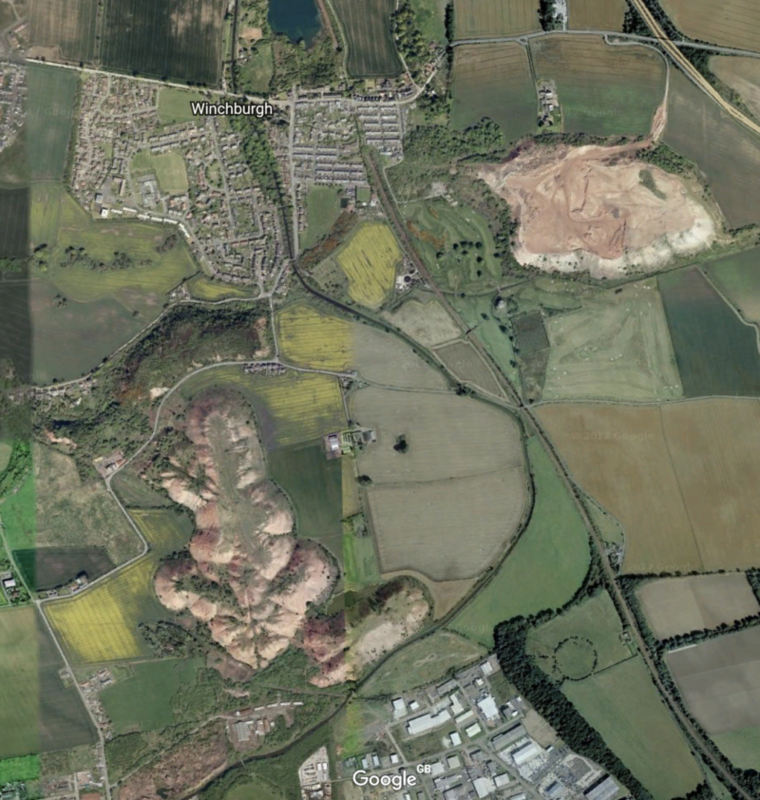 The UK’s only reserve of oil-bearing shale is in West Lothian, and it’s there that spent shale was piled into heaps known as ‘bings’. In the last days of autumn, I was taken on a field trip to these vast industrial relics. Visible from the railway line that runs between Edinburgh and Glasgow, the bings resemble a series of red mountains and plateaus looming over the fields, surrounding villages and container depots. Since the closure of the mines in the mid twentieth century, the bings have been slowly reclaimed by flora. Once hated as eyesores, the slopes are now covered with birch, willow and grasses, lichen and mosses, gorse and broom—not to mention being populated by foxes, hares, deer, badgers, butterflies and even red grouse. The bings also provide a refuge for rare alpine species, and are an important boost to local biodiversity. There is no clear route to access the bings, even though they lie within walking distance of houses and bus stops. The few dog-walkers we met nearby expressed disinterest, even dismissal of our intention to climb them. No, they didn’t know of a path to get there. No, they’d never been up, and no, they had no desire to try. They were decidedly not interested in the bings. And once we got up there—scrambling a furrow of loose shale—we could see one reason why. The other species making use of the bings was human, but a particular kind of human: men and boys on dirt bikes, their faces obscured by helmets. We stood on our plateau and watched them rev up and down the mound opposite, negotiating impossibly steep slopes, criss-crossing between the new growth and the red tracks marked out by their wheels. Soon we became used to their presence, and the screeching engines blurred into the background. It was a clear day, and as we climbed higher the view became panoramic. But we hadn’t come for the view, or any sightseeing, really—we had come looking for a concept embodied by the bings. 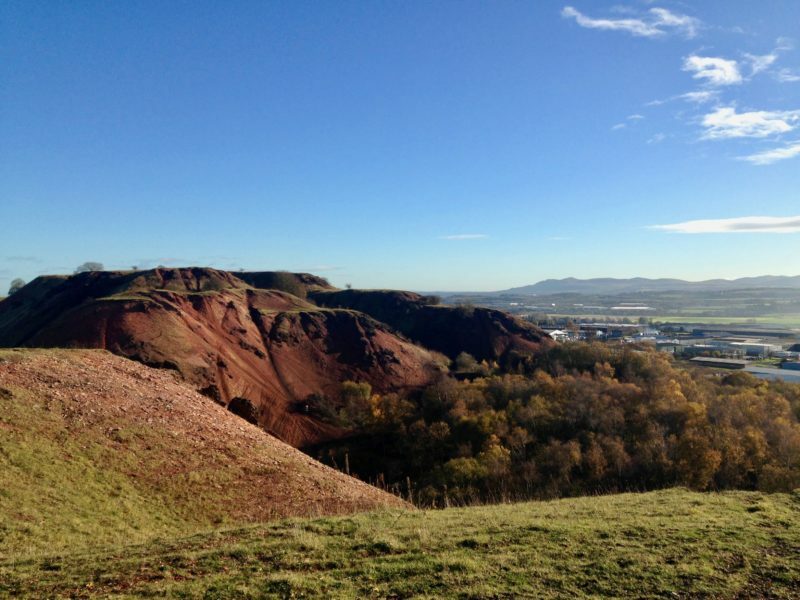 These red sediment mounds form the contours of ‘Niddrie Woman’, named by conceptual artist John Latham in 1975-6. Latham first caught sight of the bings in aerial images of the site, during his APG placement with the Scottish Office of Urban Renewal and Derelict Land Improvement. When Latham looked at the bings he didn’t just see industrial waste, but a sacred—albeit disembowelled—female form: the torso, head, heart and organs of a Neolithic goddess. There is something unsettling—I am tempted to cry essentialist!—about the evisceration of the female form under Latham’s gaze (the ‘heart’ has since been partially sold on for road fill). This reconceptualisation of the bings as a goddess of celtic myth sits within the context of his artistic generation; in Overlay: Contemporary Art and and Art of Prehistory (1983) Lucy Lippard situates Latham’s ‘Niddrie Woman’ within a (then) contemporary recourse to the prehistoric, comparing it to Silbury Hill, a Neolithic mound in Wiltshire. Unlike the earthworks of his contemporaries, Latham regarded his episode of mythologising as functional: he furthered this vision of the bings—earth goddess, maman terrible, Niddrie Woman—in order to secure their preservation. He wanted government to take the bings seriously, as a site of cultural and natural heritage, and he recognised that this wouldn’t happen without a change in perception. And changes in perception require mobilisations in language—in naming. This is a practice that conceptual legacies and identity politics share: coining a term for what already exists, so that those affected by, or outside of it are able to reconfigure their relationship to that newly expressed reality. Mansplaining, microagressions: terms and names we now call on in lieu of falling into former patterns of silence or strained tolerance. Many of Latham’s contemporaries did not quite grasp or accept the significance of his vision for preserving the site—but the naming of it allowed a space to be held until understanding came about. Such deferral is familiar to groups labelled as proponents of ‘identity politics’: holding a space in language for worlds that might exist—in the form of vernacular, politics, ethics of care—but that some aren’t yet ready to accept and adjust to. And in doing so—in the words of Samuel R. Delaney, who recently graced Glasgow—they show us that other worlds already exist. Walking on and around the bings, it was strange to think of Latham’s feminised conception of them—would that have happened without the aerial images? A change in perspective allowed him to ‘see’ a female form. I wondered too about Latham’s vision for the site’s future; He wanted it to become a sculpture park, with viewing platforms looking out across central Scotland. What would he make of the most regular visitors to the bings—not an art-seeking audience, but the dirt bikers? After all, they are the ones that have made the tracks, which in turn make the bings walkable. 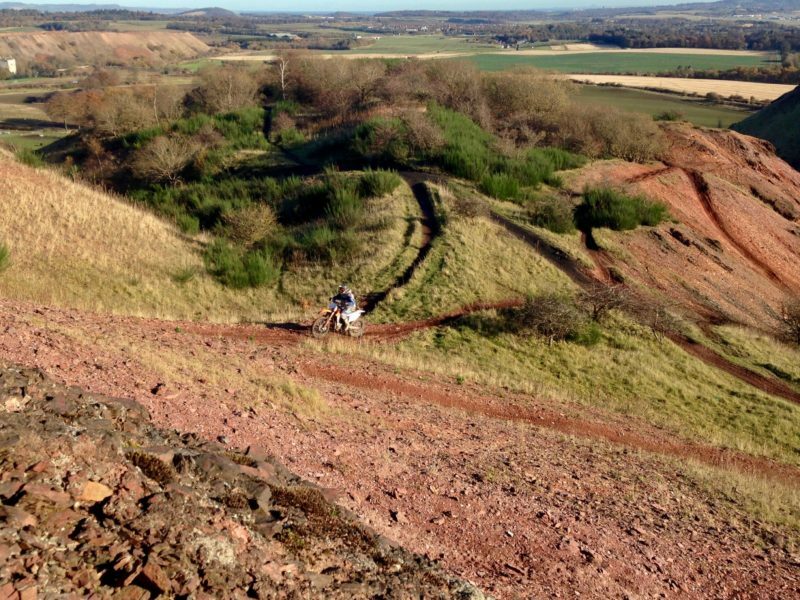 If it wasn’t for the bikers and their thrill-seeking, we wouldn’t have had the ease of navigation we did. Niddrie Woman is a document of how perceptions and attitudes alter through time. Where locals saw an eyesore and the government saw refuse, Latham saw a goddess as a means to maintain the bings, until his contemporaries, and those who came after him, were ready to understand and interpret the site in new ways. These days, the bings are overlaid with the artwork’s aura, as well as Latham’s ashes that he requested to be scattered there. Ecologists write reports on the bings’ vibrant biodiversity, and art historians take psychogeographic walks to their summits, meditating on the history of extraction. I am grateful to Craig Richardson who allowed me to join him on a field trip to the bings. His MAP feature on Latham’s Niddrie Woman from 2007 can be read in the archive, here. Thanks also to Gordon Douglas and Alec Finlay who commented on earlier versions of this text.